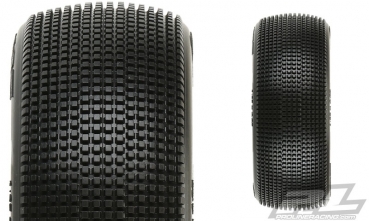 This is a pair of Pre-Mounted Fugitive Lite 1:8 Buggy Race Tires. 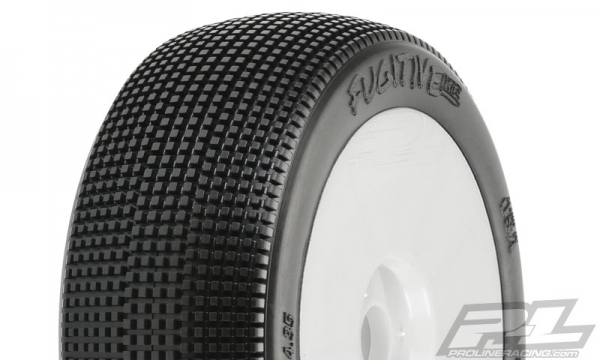 Pro-Line is putting the competition on the Run with the all-new Fugitive Lite race tire! The Fugitive Lite is the little brother to the World Championship winning Fugitive tire with a very similar tread layout but with significantly smaller pins. The smaller pins results in a lighter weight tire that accelerates and brakes quicker while still maintaining the great wear characteristics that made the Fugitive so famous. Before the Fugitive came along, the prevailing knowledge for creating a new tire that lasted throughout the long A-Mains in extreme wear conditions was to design a big and tall tire tread that was spaced out. While this was effective for the day, the tall and stiff tread numbed out the handling and didn’t have the speed of the smaller pin race tires. Pro-Line’s new Fugitive Lite tire sets the standard for wear and performance with a whole new design philosophy - small, tightly packed pins that can handle the abuse of today’s race tracks. When combined with Pro-Line’s incredible X-Compounds, the Fugitive easily has the best performance to cost ratio of any Pro-Line tire making it perfect for many European style tracks. Pro-Line is making it easier than ever to use the Fugitive Lite X-Material tires on your 1:8 Buggy by offering them pre-mounted on White Velocity V2 wheels! Pro-Line lives and breathes the philosophy of Racing To Bring You The Best and that is exactly what the Velocity V2 1:8 Buggy wheel represents. Be the first one outrunning the competition with the Fugitive Lite Tires Mounted to Velocity V2 Wheels!